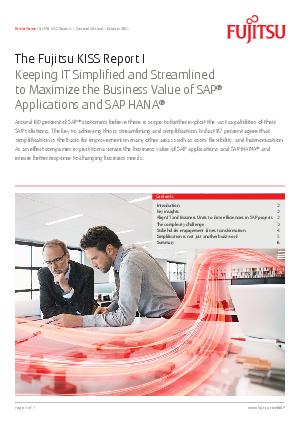 The decision to deploy SAP HANA® is often driven by business goals such as serving external customers better and faster, streamlining applications and systems, and improving business continuity. Around 87 percent of SAP® users agree that "simplification" is the basis for improvement in many areas such as costs, flexibility, and harmonization. Consequently, companies expect to maximize the business value of SAP applications and SAP HANA and ensure better response to changing business needs. All too often, these goals are more painful to achieve than originally anticipated. What contributes to this pain? First, dealing with the typical headaches associated with a big IT deployment. Second, managing the all-too-common disconnect between business and IT. Business units expect to be able to take advantage of SAP HANA right away, and they have little understanding of how much work goes into an SAP transformation. Since SAP HANA touches all departments, it’s critical to get the value from your deployment quickly. Coleman Parkes Research wrote a valuable guide on this subject in which they highlight the key aspects of an SAP deployment, informed by your industry peers.